Images by Jasper van Staveren - Galery at F18 fb - Who can show their shelves to have two Olympic Medals and at least a World Championship Title in F18, A-Class & Tornado as Helm? To my knowledge only one, and that living Legend is Mitch Booth. Add to that CV inventing the Tornado Sport (Spi) , the X40s and many more projects. 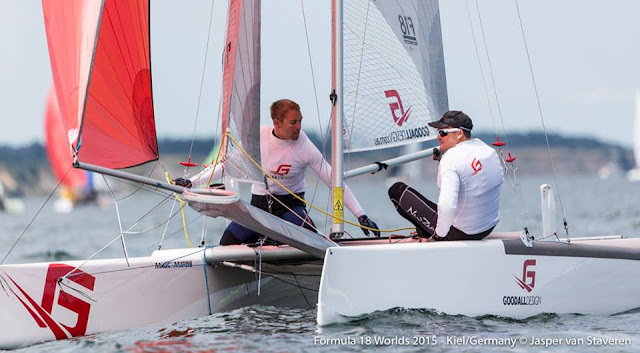 Mitch has been a drving force in the Sailing and Multihull arena for years and he also has been racing with his sons for a while. In 2011 he and his son Taylor won Texel round on a F20, and his 'little' ones have been racing SL16 and other classes. 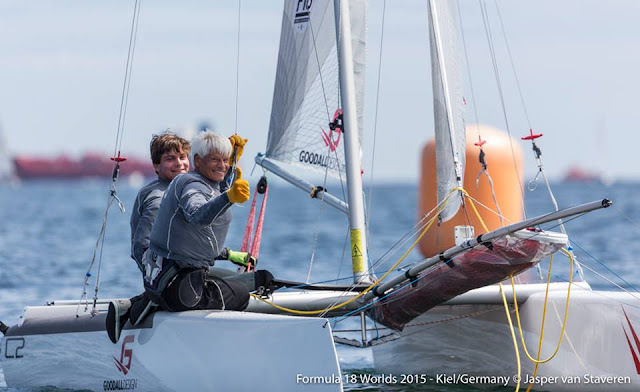 At Kiel Jordi Booth is currently 21st and his brother Ruben is crewing for his dad, both are leading the 2015 Worlds Championships at Kiel after 6 quly races sailing that 'forgotten' F18 weapon (not me though! if you have read previous F18 OP posts), the Hobie Wildcat designed by Martin Fischer. 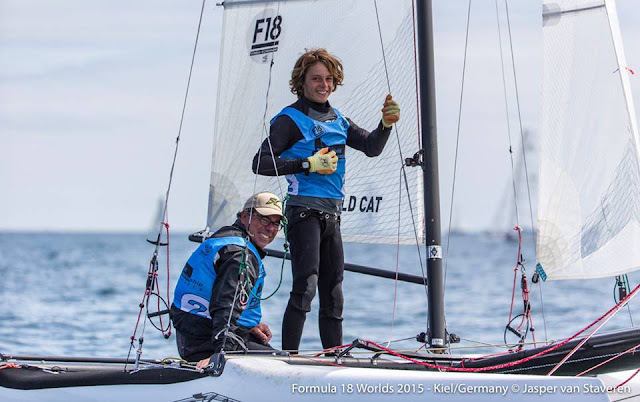 With Jordi Mitch also finished 3rd at Grossetto F18 2013 Worlds. 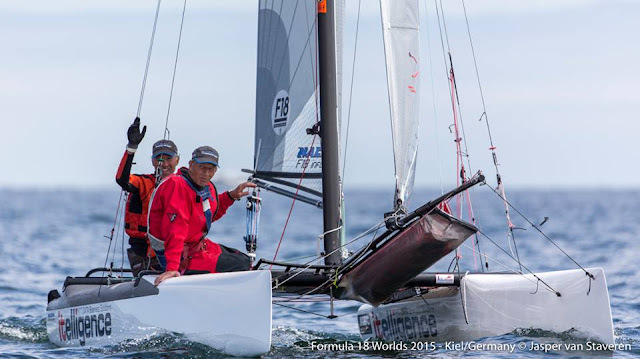 No OD class can have the appeal of what Formulas like F18 and A-Class can add to the already fun sport of sailing and racing Cats. And in the F18 we continue to have all these different designs being able to deliver a good tool for good sailors to the lead the pack. 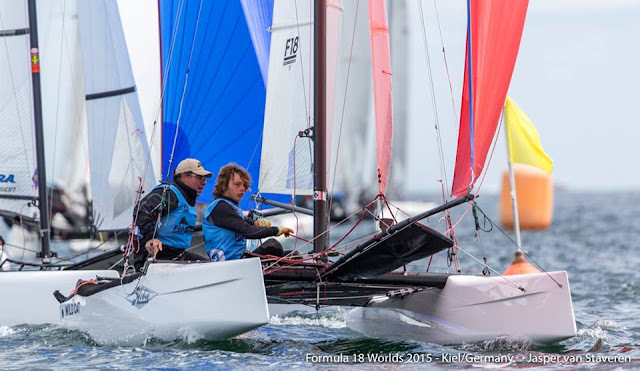 Only one race held today at Kiel, with calm winds that permitted the Org at least to complete two final races of the Qualifying stage. Tomorrow Silver & Gold Fleet will be sailing in different courses, +15-20 knots are expected and is going to be interesting to follow Mitch & Ruben fighting against the tied leaders in pts Larsen-van West , the high wind specialists Zeekant-Begemann, Ashby-Goodall who will try to climb in the rankings, Veenman-deWard, Reiss-Whitehead, Mischa-Bianchi and many others. Also we will see a swap on top finishers in each regatta, a usual sight when having to swap from 5knots racing to double trap handling mode.